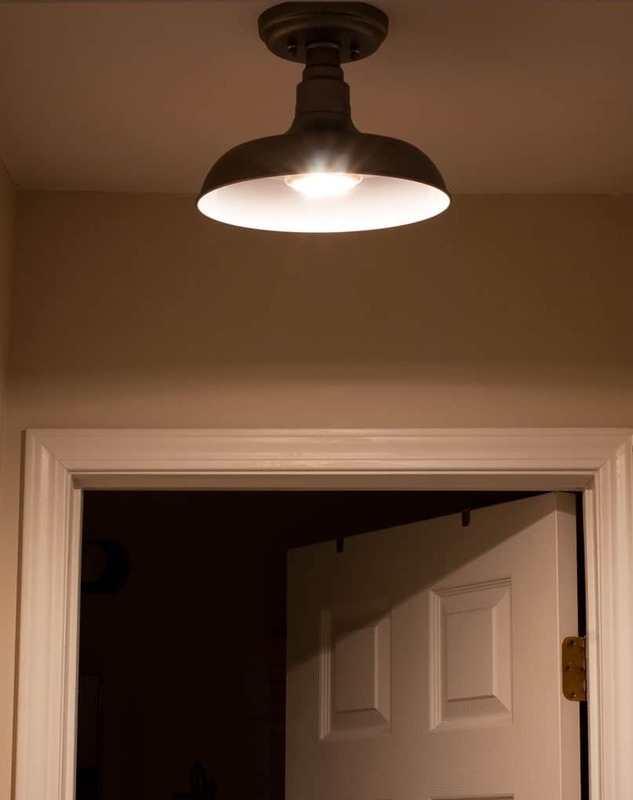 Have you always wanted a light in your hallway (or anywhere for that matter), but there wasn’t any electrical hard wiring available? 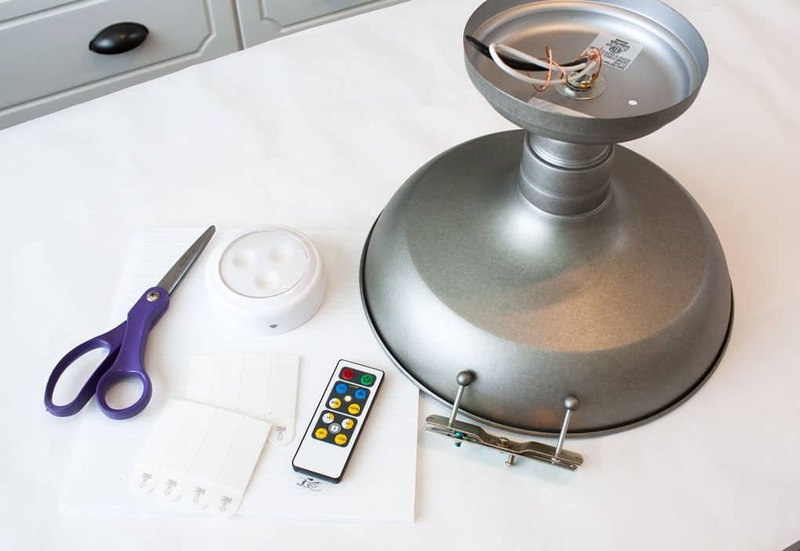 Today, we’re going to learn the trick of how to install a wireless ceiling light. Whether you have a large or small home, own your home or have an apartment, creating the perfect lighting in a room can, at times, be a challenge. Maybe you can’t find the perfect fixture, or there’s isn’t a plug close to the area where you need a lamp, or maybe, like me, you need an overhead light, but there isn’t any hard wiring available in the ceiling. What’s a girl to do? You may be wondering, “Why would you need a ceiling light when you only have 400sf of living space?” Well, let me tell ya why. 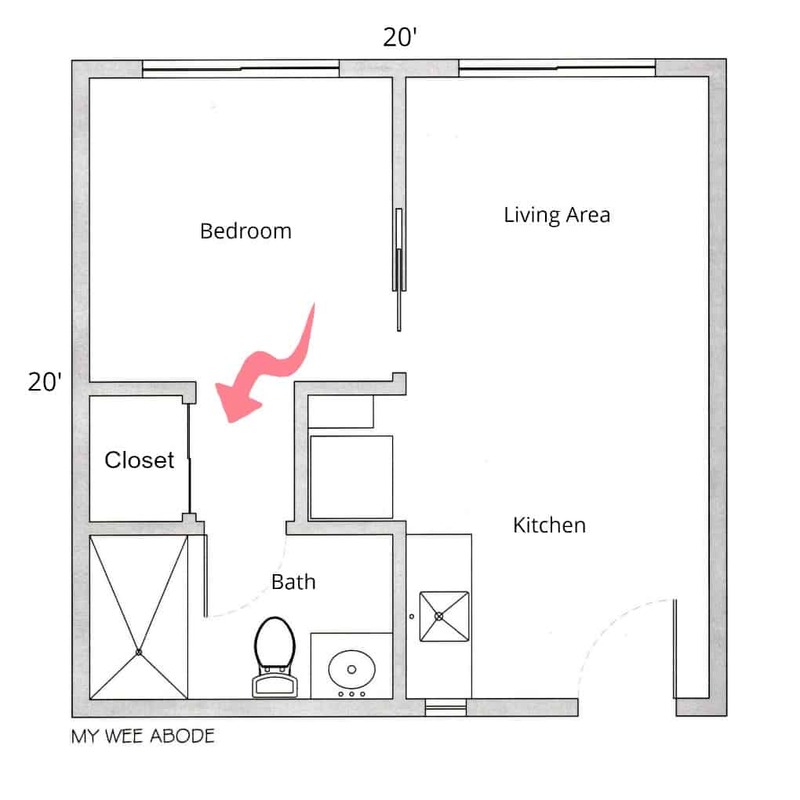 😉 In My Wee Abode there is a tiny, unlit hallway that leads from the bedroom into the bathroom. The one and only closet in MWA (besides the closet I created in less than 30 Minutes) is located in that tiny hallway and has full-length mirrors for the doors. However, often times I cannot use those mirrors for lack of lighting. 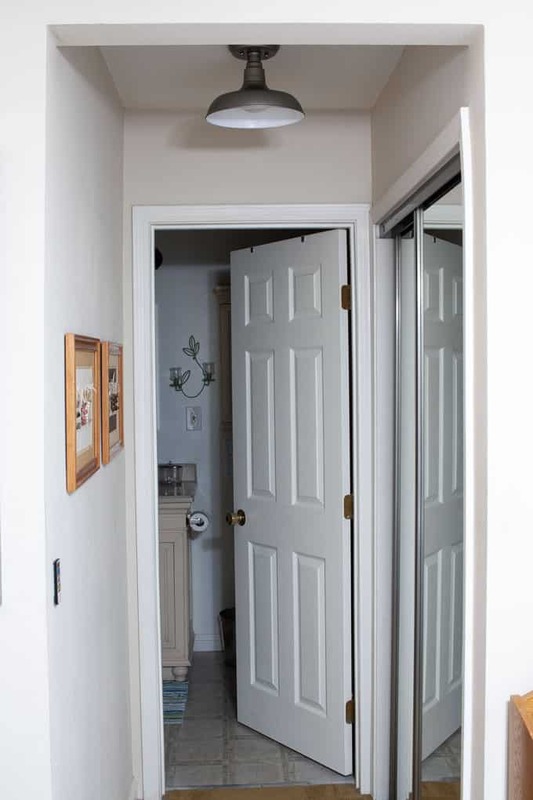 See here… the light into the hallway gets blocked by the bathroom doorway and the overhanging beam blocks the light from the bedroom. 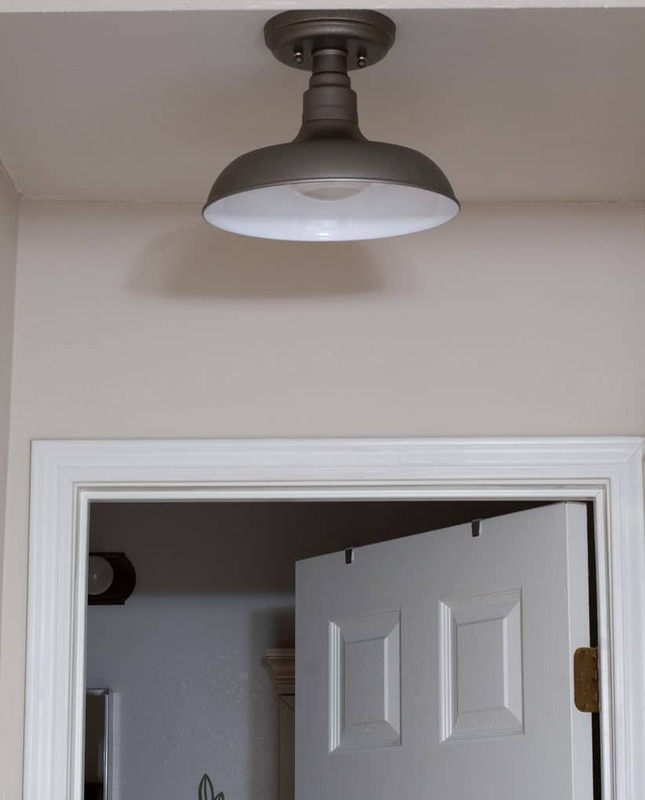 So, even when you have a small home or tiny house, additional overhead lighting can be an issue. Let’s talk about a few options for this dim dilemma. First, you could ignore it (like I did for over 2 years) and just live with the occasional irritation of looking into a gloomy mirror. Or, you could spend a small fortune and hire an electrician to cut open the drywall and hard wire the area for a standard ceiling light. ORRR, you could hack a standard overhead fixture and learn how to install a WIRELESS ceiling light! 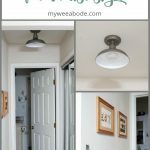 For me, option number three was a no-brainer because it was do-able, affordable, easy, versatile (I could use just about any style of fixture) and removable. Remember, when you live in an apartment or rental home, as I do, you need to be able to put things back the way you found them for when/if you move out (unless your landlord loves the upgrades as much as you do!). For another easy and affordable lighting solution, take a look at my Small Space Coffee Station! 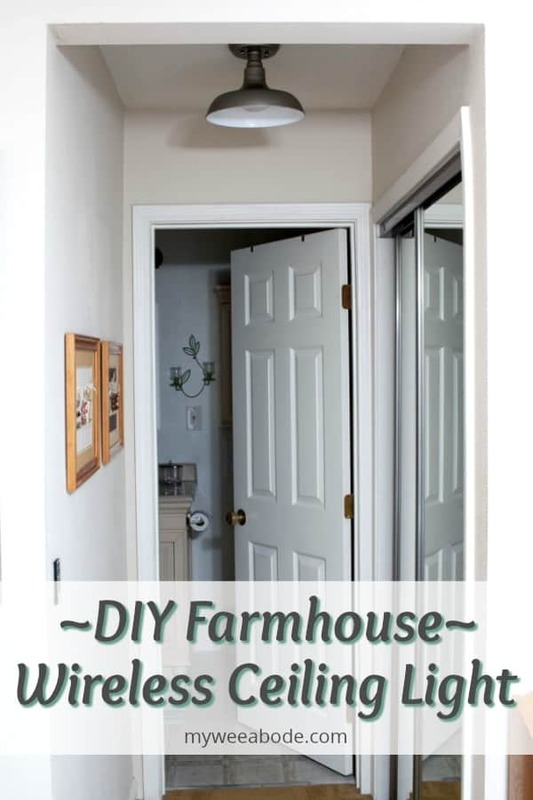 Here are the steps to create a farmhouse style (or any style) ceiling light that doesn’t require hard wiring, but DOES have a remote! Using rubbing alcohol, clean the inside of the fixture, the back of the puck, and both sides of the plastic sheet. In order for the puck light to adhere to the fixture, you will be using the Command Strips. However, on this fixture, the socket protruded just a wee bit too much and there wasn’t anything for the puck to attach to. If you find you have the same issue, using a round plate as a stencil, cut out a piece of the coated poster board to fit the inside of the fixture. 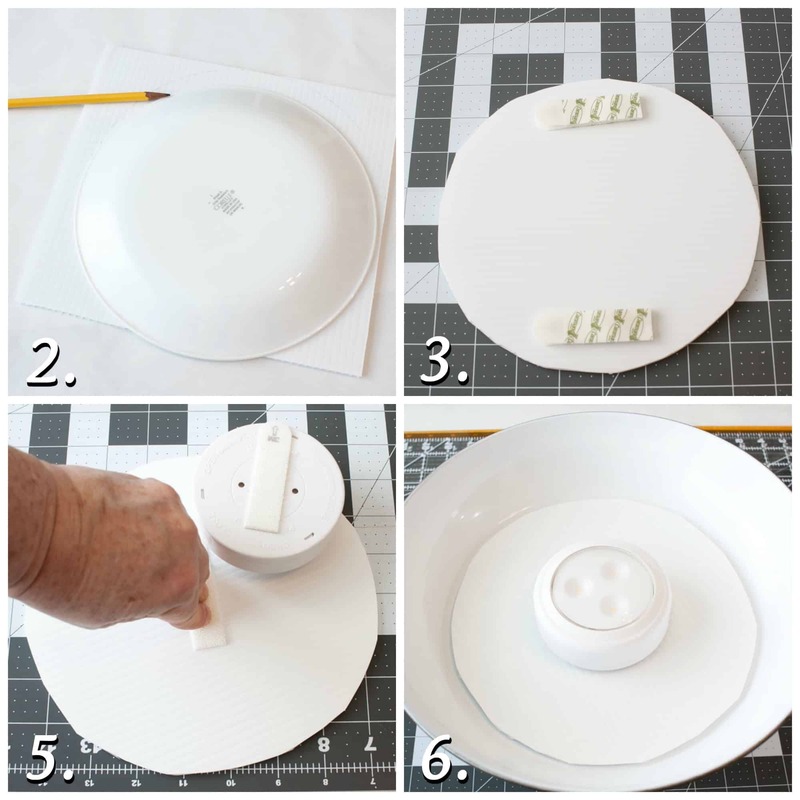 Following the instructions on the Picture Command Strips (PCS) box, attach two pairs of PCS to one side of the plastic sheeting and then attach the sheeting to the light fixture, making sure to center the plastic. Press down for thirty seconds and then remove the plastic sheet. You should now have PCS on both the light fixture and the plastic sheet. Remember, follow those instructions on the PCS box. Next, add one set of PCS to the back of the puck light (be sure not to cover any important info on the light). If you followed the directions on the PCS box, your plastic sheet should be detached from the fixture. Turn the sheet to the side that doesn’t have the PCS on it. Center the puck light on that side and attach it to the plastic sheeting… follow the PCS box instructions (Have I said that enough?). After the Command Strips have set, assemble the light. 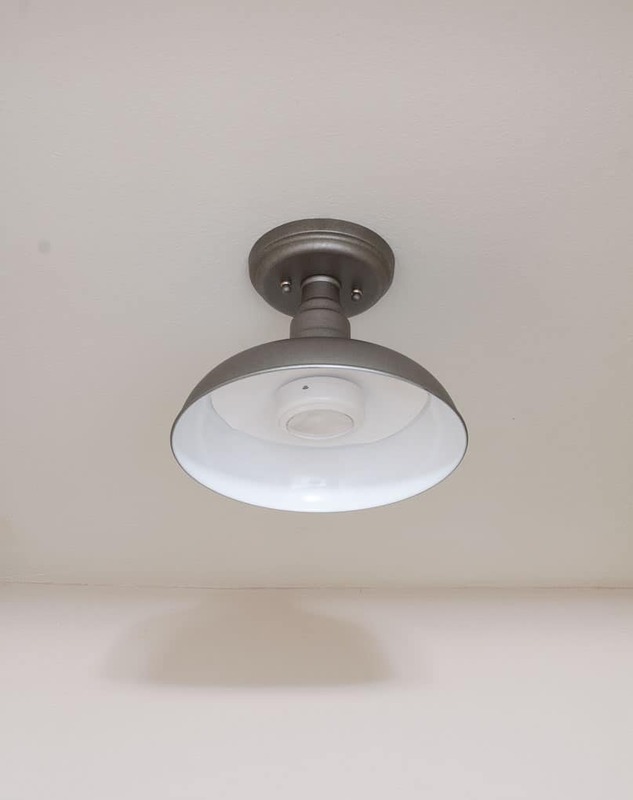 To mount the light fixture to the ceiling, simply remove any hardware from the mounting bracket that may not be needed (I had to remove two screws that were not important). Then, simply attach the bracket to the ceiling (I used a drill, one anchor, and a screw). Now you can attach your ceiling light to the bracket (I left the ceiling light wiring attached to the fixture, in case I ever want to use it the ‘real’ way.) If you want more instructions on how to mount the bracket and light fixture, let me know in the comments. For obvious reasons, a magic ceiling light needs to have a remote that acts like a switch on the wall. 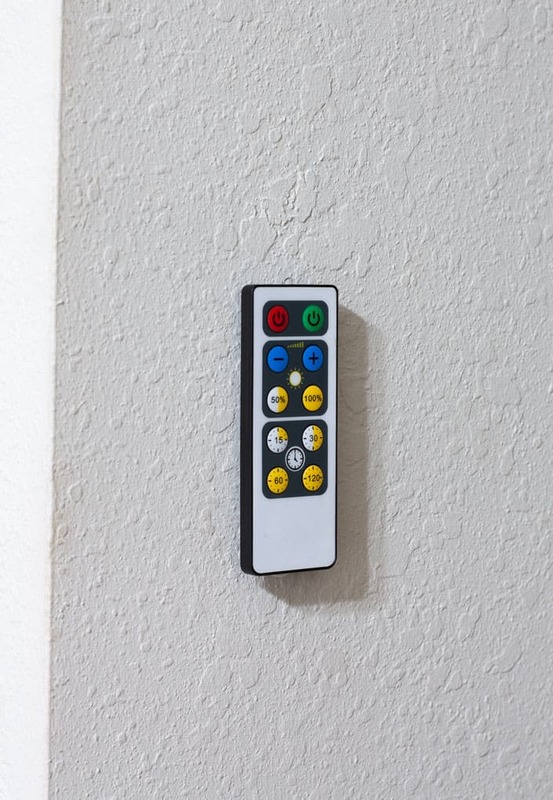 Simply take another set of PCS and attach it to the remote and then to the wall (again, follow those PCS instructions on the box… I guess I haven’t said it enough 😉 ). There’s only one trick to making the remote work with the puck light… be sure that the sensor on the puck light is ‘facing’ the remote. Other than that, all you have to do is remove the plastic insert on the remote and push the power button. Voila! And here is some perspective on what it looks like in the actual hallway. And here it is, complete and ready to light up my life! Originally, I was going to use a sconce version of this light on the wall (kinda like the one that Sarah used in her reading nook). I purchased it and brought it home, but when I held it up on the wall to see how I liked it, it just looked WAY too cluttered. 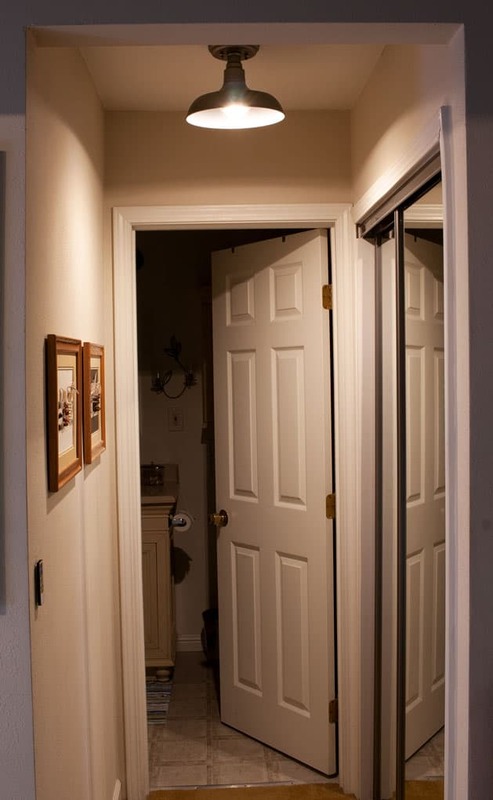 This small hallway needed the ‘flush mount’ light to keep the light and airy look that I love. What do you think? Close-up of my new farmhouse wireless ceiling light. Here it is turned on in the dark. Crazy that there is no hard wire, huh? All you (I) have to do is replace the batteries. I LOVE IT! Quick, easy, versatile, affordable, and lovely, this magic ceiling light hack was the perfect solution for my little loft apartment. 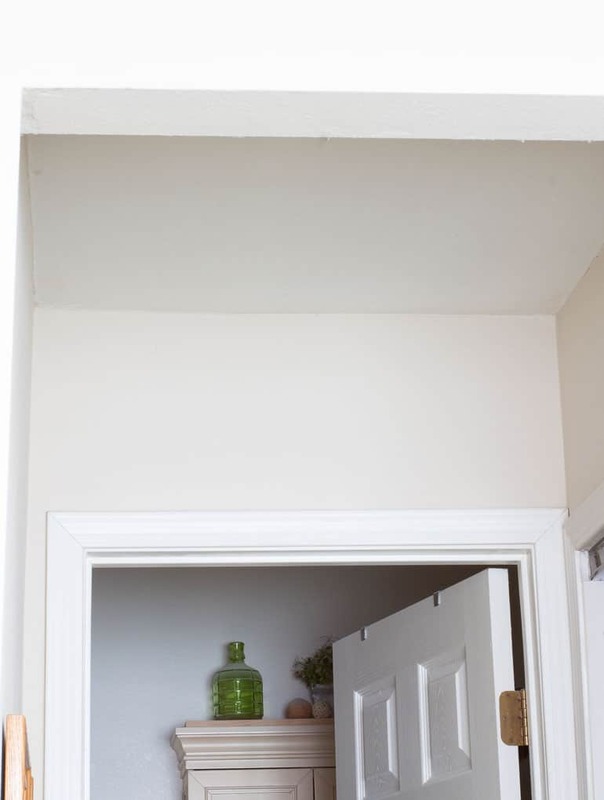 And this trick can be used on just about any lighting fixture. Do you need to add some light to an area in your home that doesn’t have any wiring in the walls? Maybe a reading nook, or in a bedroom that doesn’t have enough room for a side table lamp, or maybe on the wall in the dining room… so many possibilities! What do you think? Is this something that YOU will be adding to your home? Let me know in the comments, or feel free to share a photo with me on Facebook. Also, let me know if you have any questions or want more info! Very interesting Julie. The puck lights I have bought in the past weren’t very bright. Is there a wattage on the puck light package ? There is no wattage on the package, but it does say it is 55 lumens. The converter I just googled says that is equal to 4 watts. I’m not sure that is right, because this seems definitely brighter than a measly 4 watts. It seems to give off more of a 40-watt bulb, which is sufficient for my needs. There are other puck lights with higher lumens available. Funny, I had the same question for Sarah when she shared her sconces. She said the two of them together gave off plenty of light for reading… I would agree. Hope that helps! Hugs! Great job. You are so smart to come up with the idea for your hall. We all usually have a dark place somewhere in our homes such as closets or hallways. I am sure this will be a good project for a lot of us. Keep up the great blog. Looks great. Love your blog. Great solution and I love how it looks! Thanks, Carol. I’m so happy with it… and my landlord just texted me… she’s doing an annual walk-through. Didn’t say anything about it, but said everything looks good. 🙂 Hehe. What a great idea, and I’m shocked by the amount of light that put off. Isn’t it wonderful that you were inspired by another blogger and retained that inspiration for two years until you needed it yourself? Aw, thanks, Toni. Yes… Sarah’s post impressed me in a big way. 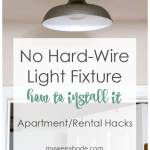 This is such an effective fix, especially for rental homes… and for those of us that don’t know the first bit about electrical work. Hugs! This is such an awesome idea!! I will check out Sarah’s post as well! Your light looks amazing! Thanks for sharing! Thank you so much, Cindy! I think you will really enjoy Sarah’s blog! Have a wonderful day! It looks fantastic. What a great idea ! Thank you, Lindy! So glad you commented. 😀 Hugs and hearts! Thank you so much for this lighting information! I have a need for something like this in my cloffice. Your pictures and instructions make everything so clear. Yay! I wanna see when/if you do it in your cloffice! (love that word, btw). Hugs, dear friend! It looks fabulous. You wouldn’t know that it is wireless by looking at it. And it seems to throw quite a bit of light. Great job Julie! Thanks, Melan… it gives off plenty of illumination for my purpose. And you can actually purchase even stronger ones. 🙂 Hugs! Now that is something I can really get on board with, I hate having to deal with wires. And Julie your ceiling light is very pretty. So clever, Julie! I had not thought about using something like this and disguising it with a beautiful light fixture. 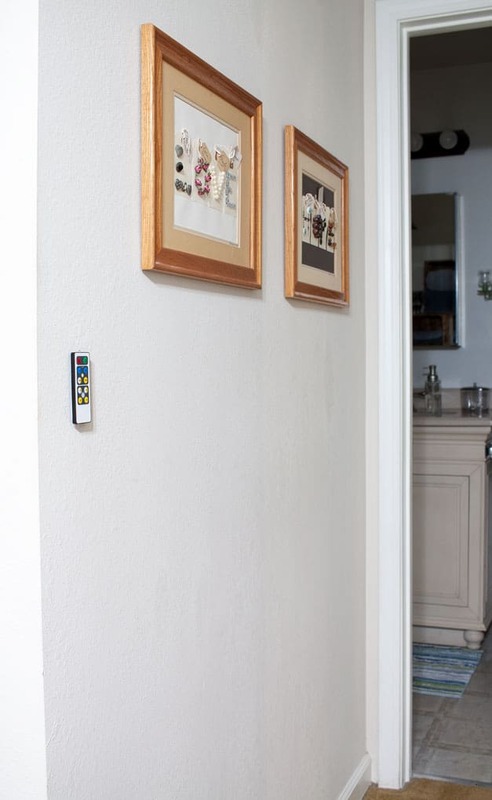 You know, my hubby is all about motion-sensor lighting. I’ll have to ask him what he uses. He even installed one in my bathroom cabinet under the sink so I won’t have to turn the lights on if I get up for something. Pinning! I actually have a motion sensor light where my coffee bar is. I LOVE it for the same reason as your bathroom… I can easily make coffee in the morning without turning all the lights on. Woot! Hugs, sweet friend! What a clever solution for a low light area, plus it looks great, too! Your instructions are great and would be easy to follow.Thanks for sharing with us at Snickerdoodle, Julie! Thanks Beverly. I always worry that I might be giving too many instructions. I think I get it from writing software user manuals during my analyst days! 😉 Hugs! Julie, this is genius! Pinning this for future reference for sure!! This is so darn clever! I really like the look of that…I was afraid you were going to start cutting holes in your ceiling, lol. Pinning! Hehe!!!! No can do in a rental home! And my landlord didn’t even notice the light when she came in today! Hehe! Smart girl for figuring out how to light this dark hallway! Love your idea Julie! Thank you, Michelle. I love when we are inspired by other bloggers, and can put our own twist on it! 😉 Hugs! This is seriously BRILLIANT! Thank you so much for sharing. I need to pin this project for all the places that I didn’t think I was able to put a light. Awwww, go on! No, really, go on! 😉 LOL! You are so sweet, KariAnne! Thank you for the encouragement and love, AND for linking up at the party! Hugs! I agree – very clever solution and such a stylish hall lamp!!! Nicely done!! Thanks so much, Peg… I REALLY love it! Hugs, dear friend! Love this! My home has a few closets that are lacking overhead lights! I need to try this! Oooo, would love to for you to share when/if you install some! Thanks for dropping in, sweet Lauren! Wow, this is brilliant! Hiring an electrician can be so expensive. With this idea, a light can be installed anywhere! I like the style of light you chose. Thanks, Debra… it actually took me a bit to find a barn/farmhouse ceiling light, at an affordable price. I love it! Be sure to link-up at the Homestyle Gathering that opened today. Hugs and hearts! This a such a fantastic idea! Our house did not have any ceiling lights when we moved in. Over time my husband has installed pot lights in many of the rooms but not all and now I know just what to do. Fabulous share Julie! Thanks, Patti! So happy you enjoyed the post… you made my day! 😉 Make sure to link-up at the Homestyle Gathering today. Would love for you to share with our readers! This is great! I have a puck light in that dark hall closet, but it’s the kind you push the top of the light to turn it on and off. That means it’s on a side wall in the closet and not on the ceiling. It’s okay, but not a great solution. THIS gets the puck light on the ceiling where it does the most good. Amazing! When I get this done in my closet I’ll share pics. Thanks, Julie! Oh, I’m so glad you got some inspiration and solutions! Definitely share pics when you get it done! And be sure to link-up at the party today! Thank you so much for the double-pin, Barbara. And thank you for the sweet words! You are a sweetheart! I am so proud of you that you did this, its hard to deal with electrical wiring. Great tips. Hehe! You made me giggle with joy that you are proud of me. 😀 Thanks for coming by, my friend! What a great idea and thank you for the clear instructions and photos! I am off now to read your post about the coffee area light! Oh, thanks, Connie! And welcome to My Wee Abode! You do lovely quilt work! Please join us at Homestyle Gathering each Tuesday! Hugs and hearts! Looks great, Julie! I had just ordered supplies to try this hack for a wall sconce! Thanks, Dee! I’m SO happy with it! Hugs and hearts! What a great idea! Thank you for sharing! I’m saving. Oh, so glad you like this, Diane. You are so welcome! Hugs and hearts! What a great product. I have never heard of a wireless fan. Such a good idea. Thank you for posting all about this fan. Sure thing, Sue! Hope this wireless ceiling light comes in handy for lots of people! Hugs!